Airtist's renderin o MESSENGER orbitin Mercur. MESSENGER (a backronym o MErcury Surface, Space ENvironment, GEochemistry, and Ranging, an a reference tae the Roman meethological messenger, Mercury) wis a NASA robotic spacecraft that orbited the planet Mercur atween 2011 an 2015. ↑ Lee, Jimmy; Galuska, Mike (March 18, 2011). 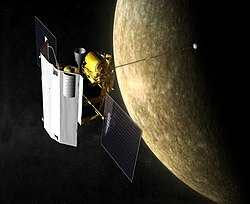 "NASA Chats - MESSENGER Prepares to Orbit Mercury". NASA. Archived frae the oreeginal on June 7, 2011. Retrieved March 18, 2011. ↑ Wendel, J. (April 2015). "Mercury's secrets revealed by soon-to-crash spacecraft". Eos. 96. doi:10.1029/2015EO029165. This page wis last eeditit on 10 Julie 2016, at 20:05.